The Black-capped Chickadee is generally the most abundant permanent resident at Cedar Creek. Chickadees probably fledge more young than any other bird at Cedar Creek, and the woods are alive with juvenile and adult chickadees in the summer and fall. In most years there is no discernible chickadee migration at Cedar Creek. Chickadees are common to abundant in all wooded and bushy habitat at Cedar Creek. The many rotten birches, aspens, and alders provide them with sites to excavate nest cavities. 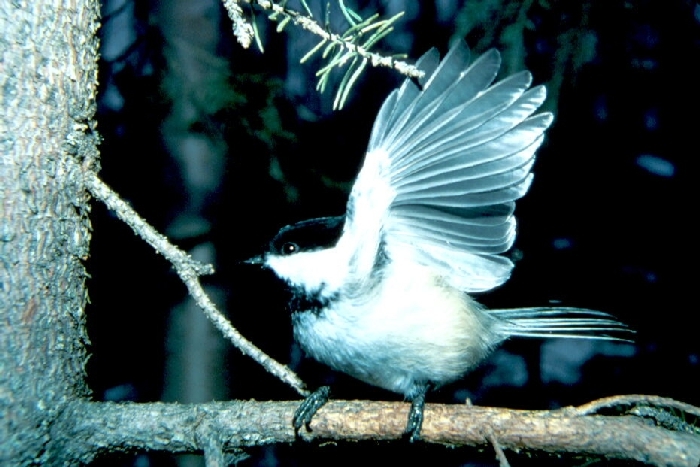 The chickadee population at Cedar Creek nearly quadrupled between 1976 and 1988, despite several very cold winters and winters of record snowfall. Tufted Titmice used the feeders at Corneia's cabin during the early years of Cedar Creek. There have been no titmouse records for more than 25 years. Titmice are apparently retreating from central Minnesota, as shown by their increasing rarity on Christmas counts.